Mumbai: Along with a meal or preferred seat, air passengers in India may soon have the option to choose WiFi services while booking a flight ticket, a person with direct knowledge of the matter said. Ever since the Telecom Commission approved WiFi services in domestic flights on 1 May, there has been interest from several airlines. The list includes major domestic airlines, who see this as an opportunity to increase their non-aero revenues, said a senior official at the department of telecommunications (DoT), who didn’t want to be named. DoT is now in the process of creating a separate category of licensees called in-flight connectivity provider who will provide internet as well as voice services within Indian territorial airspace in both domestic and international flights. DoT will soon start framing licence terms for these providers and invite applications over the next two-three months. Major domestic airlines are clearly interested in providing such services. “We are studying the recommendations in detail, and in due course, we will determine the economics of offering the service on domestic and/or international routes," said a Vistara spokesperson. An Air India official said that the national carrier would definitely consider introducing WiFi services once there is a more clarity around its business model. SpiceJet’s chairman Ajay Singh said earlier this month that his airline would be one of the first to offer inflight connectivity. Queries sent to Jet Airways, IndiGo, GoAir and AirAsia India did not get responses. However, industry experts say that bundling inflight WiFi along with other services could be a difficult proposition for airlines to sell to economy passengers. 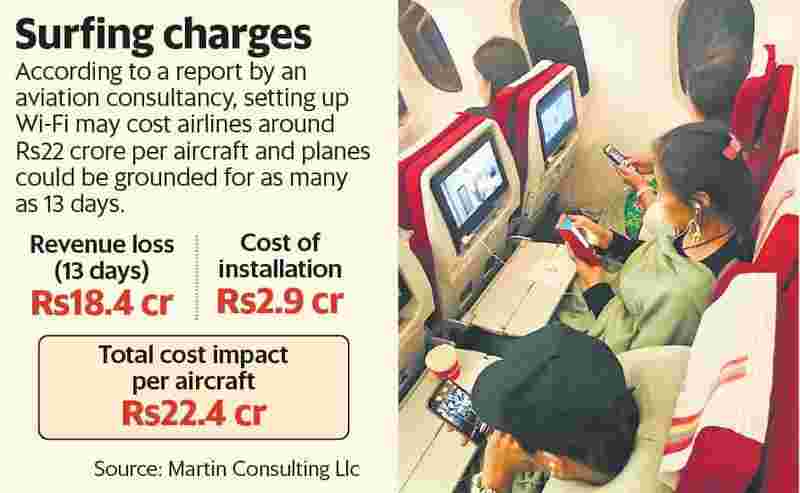 “It would be difficult to bundle for economy class initially, given the high capex involved," said Amber Dubey, partner and India head of aerospace and defence at KPMG, adding that passengers may not mind paying up to Rs200-300 for a two-hour flight. According to an analysis on WiFi installations on Indian carriers by aviation consultancy Martin Consulting Llc, installing WiFi in an aircraft, including the aftermarket kit, maintenance, testing, crew training and certification, may cost airlines Rs22 crore per aircraft. The airplanes could be grounded for as many as 13 days for installing on-board WiFi, the report said.